I am posting this a tid bit later than usual because things are a bit hectic at work right now–namely, because tomorrow is my last day and Monday has me starting a new job! It’s a very exciting time for me, but change is change and, like most humans, change can be a bit, um–overwhelming? So, I have been wrapping up huge projects where I can, creating transition plans where I can’t, and packing up my desk in preparation for my next adventure. I am super excited about my new gig–it’s a fantastic job working for a respected company–but I’m super bummed to be leaving a few of my work chums. We’ve been in the software trenches together for nearly three years…and while I know I will stay in contact with many of them, it won’t be the same day-to-day connection. That part is a bit hard. On the up side, I have a whole new group of people to get to know, learn from and bond with. Here’s my newest piece…what do you think? It’s late and it’s time for bed…so, that’s all for this week. Wishing you a blissful night’s sleep, a rejuvenating weekend, and as much fun as you can stand. 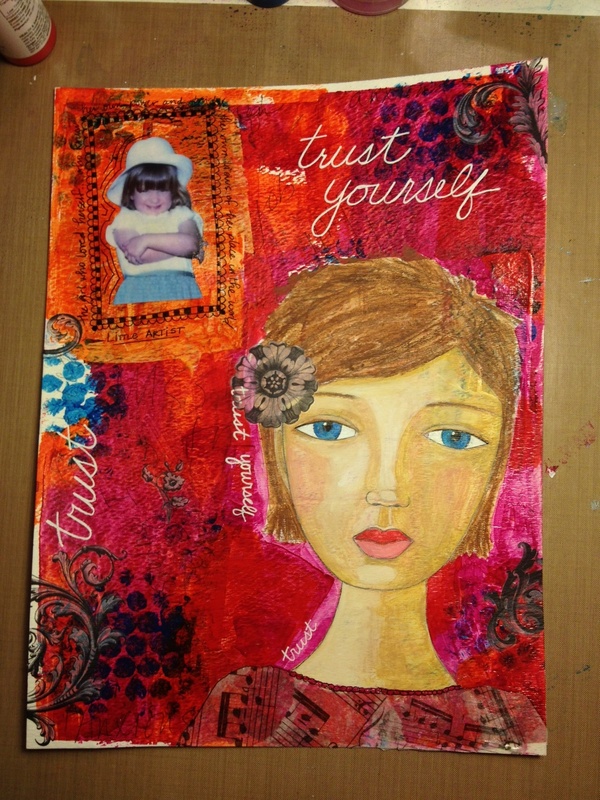 This entry was posted in LifeBook 2013, Mixed Media and tagged collage, doodle, LifeBook 2013, mixed media, new job, paint, self portrait. Bookmark the permalink. Rachel – this is beautiful! I love this piece! I hope everything is going well with the new job.